We are so pleased to continue our close partnership with OCAD University. The rich and diverse artwork we receive from their students, graduates and faculty, provides color and light to our work environment. You and a guest are invited to attend the 9th annual Mercedes-Benz Financial Services Experiencing Perspectives art reception in Mississauga on Tuesday, October 17 from 6:00 to 8:30 p.m.
We are so pleased to continue our close partnership with OCAD University. The rich and diverse artwork we receive from their students, graduates and faculty, provides color and light to our MBFS work environment. 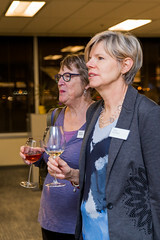 You and a guest are invited to attend the 8th annual Mercedes-Benz Financial Services Experiencing Perspectives art reception in Mississauga on Wednesday, November 16 from 6:00 to 8:30 p.m.
At Mercedes-Benz Financial Services, immense value is placed on the influence that art has in the workplace. 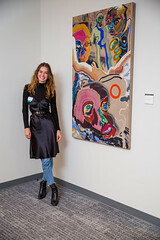 Thanks to a special partnership with OCAD University, MBFS is able to enhance its work environment with cutting-edge art from their students, graduates and faculty. Please join in viewing the exhibition, meeting the artists, and being inspired. Beverages and hors d’oeuvres will be served. Please click here to register for this event by Friday, November 11. Art is the spirit of the Mercedes-Benz Financial Services workplace. Please join us as we celebrate our seventh installation of the Experiencing Perspectives Art Exhibition, featuring creations from the students, alumni and professors from the Drawing & Painting Department of OCAD University, the largest and most comprehensive art, design and media institution in Canada. Meet the artists. Tour the exhibition in our office space. Enjoy cuisine and conversation. Art is a signature element of the Mercedes-Benz Financial Services workplace. Please join us as we celebrate our sixth installation of the Experiencing Perspectives Art Exhibition, featuring creations from the students, alumni and professors from the Drawing & Painting Department of OCAD University, the largest and most comprehensive art, design and media institution in Canada. Meet the artists. Tour the exhibition in our newly expanded office space. Enjoy cuisine and conversation. Mercedes-Benz Financial Services is a company in the business of automotive finance. Our facilities are not galleries, but they display some of today’s most cutting-edge art. Our employees are not artists, but they are inspired by various forms of art each day from the students, faculty, and alumni of OCAD University’s renowned Drawing and Painting Department. Please join us for the celebration of our fifth annual exhibition of OCAD University’s art at Mercedes-Benz Financial Services. 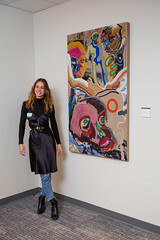 You and a guest are invited to view the exhibition, make new connections and be inspired. Beverages and hors d’oeuvres will be served. Mercedes-Benz Financial Services is a company in the automotive financing business. Its facilities are not galleries, but they display some of the most cutting-edge art today. Its employees are not artists, but they are inspired by various forms of art each day — art from the students, faculty, and alumni of OCAD University’s renowned Drawing and Painting Department. Please join us in celebrating the fourth annual exhibition and ongoing partnership between OCADU and MBFS. You and a guest are invited to view the exhibition, make new connections and be inspired. Beverages and hors d’oeuvres will be served. Please join us in celebrating the third annual exhibition and ongoing partnership between OCADU and MBFS. You and a guest are invited to view the exhibition, make new connections and be inspired. Beverages and hors d’oeuvres will be served.